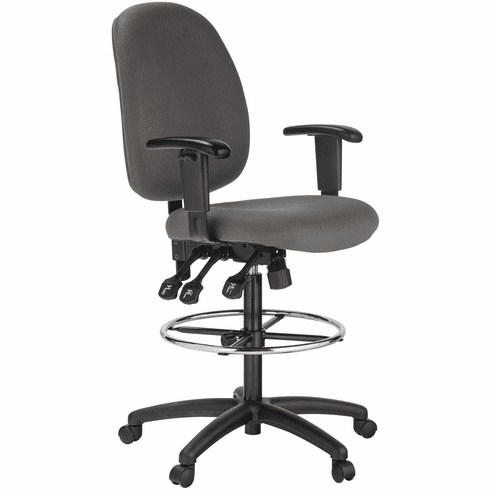 Office Chairs Unlimited Top Seller! This is the tallest drafting chair that we carry... and it's very ergonomic! This multi-function, ergonomic drafting chair from Harwick features a contoured seat and back cushion for all-day comfort, one touch pneumatic seat height adjustment and tilt with tilt tension adjustment. Choose from black or grey commercial grade fabric. Other notable features include seat angle adjustment, back angle adjustment, back height adjustment, height and width adjustable armrests, fully upholstered backrest (no plastic shell on the back), 19" height adjustable chrome footring and a heavy duty nylon base with dual wheel carpet casters. Dimensions: Seat Size: 20"W x 19.5"D. Back Size: 17.5"W x 19"-22"H. Seat height adjustment: 26"-35"H. Ten year limited warranty from Harwick. These adjustable drafting chairs normally ship the same day from our PA warehouse (if ordered by 2 EST).